The youngest of ten dragon brothers, the Littlest Dragon always has the best and brightest ideas for getting his own way. First book about this successful character. A Collins Roaring Good Read for new readers. 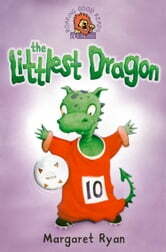 The Littlest Dragon is known as Number 10. He is the youngest in a family of ten dragon brothers and in this first book about him, there are two stories. The first story is where aThe Littlest Dragon has to come up with the best and brightest way to get a good night’s sleep. In the second story, the big dragon brothers won’t let The Littlest Dragon play football with them, so he has to be resourceful and get his own kit together and persuade Mum to take him to the match. Then he manages to come up with an idea which wins the praise of the most famous footballing dragon in the world, Dragon McFeet,. Number Ten gets to keep his winning jersey, much to the disgust of his brothers.